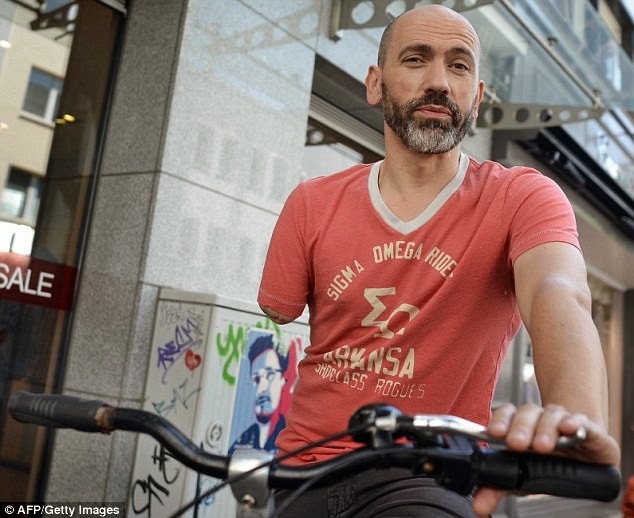 German police have apologised to a one-armed cyclist after they pulled him over and fined him for riding one-handed. 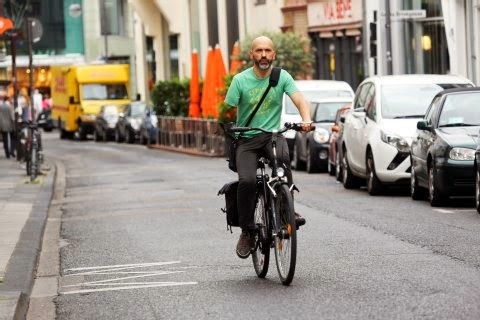 Bogdan Ionescu was travelling through Cologne city centre when he was stopped by overzealous officer who told him he was riding dangerously. attention to the customised bicycle, fining him €25 for having adapted his brakes to work off a single lever - despite the fact doing so was perfectly legal. Reports of Mr Ionescu's unusual legal issue made national news in Germany this week, and he has since had his fine cancelled and received a full apology from Cologne's police. The officers originally claimed his bicycle breached German safety standards by not having two hand brake levers, as Mr Ionescu had moved so it could be activated using his foot. After a 25 minute argument with the officer at the side of the road - during which he claims the officer also incorrectly accused him of not having legally required lights on his bicycle - Mr Ionescu reluctantly paid the fine as he was running late for a meeting at work. But research by the Kölner Stadtanzeiger newspaper revealed that the modifications Mr Ionescu made to his bicycle - which meant he still had two working brakes - ensured it remained roadworthy. Although Mr Ionescu says he has complained about his treatment and reported the officers for discrimination, police officials claim they were only made aware of the issue when he took his story to the newspaper. They say that as soon as they realised the matter needed correcting, administrators contacted Mr Ionescu to apologise and offer him a refund. There was an initial dispute over how much that refund would be - the police claimed only €5 of the €25 was for the brake level, saying the remaining €20 was punishment for the apparently faulty light. But when Mr Ionescu was able to prove that his light worked off a dynamo powered by his pedals, rather than a battery, a full refund was agreed. Speaking to Kölner Stadtanzeiger, he said he was relieved that the fine had finally been dropped. 'It's great news, I'm really happy,' he said, adding that the incident had been weighing on him over the past weeks, leaving him frustrated and feeling discriminated against. 'It's good that this is how it ends, it's unbelievably good, he said.